Energy Efficient Vehicles, or EEV in short, is an integral part of the NAP 2014. In fact, the main objective of the new policy is to make Malaysia the regional automotive hub of EEV. We’ve been throwing the term about for quite a while now, but what exactly is EEV? The official classifications have just been detailed. As such, it covers the whole spectrum of car technologies, be it petrol-, diesel- or hybrid-powered vehicles. As long as a vehicle meets the defined specifications, it is classified as an EEV. Even alternate and future technologies (EVs, Hydrogen and Fuel Cell) are covered under the EEV umbrella. Those defined specifications are divided into 14 different classes (10 for cars and the remaining four for two-wheeled vehicles), with each one having to conform to a unique set of criteria (kerb weight and fuel efficiency for now, with carbon emissions only coming into effect once the decision on the introduction of Euro 4 fuels has been finalised). Refer to the images above for the specific class-by-class breakdown. Fuel efficiency will be measured according to the UN ECE R101 standard. Once classified as an EEV, the model in question will be subject to receive a set of (yet-undefined) customised incentives, which can include tax breaks. No other detail has been released as of yet, so what you see here is what you get. So, dear readers, what do you think of the EEV classifications? Discuss below. Most cars already fall into this category. The carbon emission level is going to be used as a tool as to what/who gets the tax break. I foresee this coming. What I want to know is what are the excise rate for each categories..eg Mirage GS currently around 34% tax(including sales tax)(based on comparison between peninsular n langkawi selling price). Really sad with the level of brain drain that we have in our country. MAI as the so called “think tank” to catapult the Malaysian automotive industry, after much delay, can only come up with this? It looks like the policy is drafted deliberately to exclude the highly efficient forced induction direct injection engines. What will be the incentive for automakers to produce their high tech and expensive cars here when there is lack of domestic demand due to the high selling price? Our policy should be made such thay it will attract foreign components manufacturers for these high tech engines to invest in our country. The spill over effect will also benefit our own car manufacturer like Proton & Perodua. The absence of a very small but very important detail in this announcement shows that how much thoughts have been put into drafting this policy. The detail that I meant here is the lack of clarification on the driving cycle which the fuel consumption and CO2 level is measured from. Are these figures based on NEDC, Japanese Standard, American Standard or it is just based on Proton’s constant 90kmh standard? Where can I get this statement saying using ECE101 standard? Don’t confuse the rakyat by making categories and all this EEV nonsense. What is more important, where is the real price reduction? Where is Najib’s promise of 30% reduction in car prices over a period of 5 years? Najib promised before the election that if we voted for him and BN, he would ensure that he would match PKR’s offer to reduce car prices. Najib himself quoted saying that the BN government would reduce car prices by up to 30% gradually over 5 years and we should trust BN. Infact he said BN always keeps to their word. 7 months have passed and nothing has been done. He promised last year! Infact companies like Toyota and VW have increased their prices. Does not matter now whether a car is EEV or ELV. What matters now is where is Najib’s promise? Madani, please ask your boss Najib to honour his promise. This basic thing also MAI cannot do, how can the rakyat trust MAI and the BN Government? The reduction in your chart is Superficial. Got no meaning at all or any real savings to the rakyat. It is unfair, while we rakyat are told to eat Kangkung, the Minister’s wives are buying Birkin handbags costing RM100,000 each. And that also one person got berpuluh puluh Birkin handbags. And the AP robbery is still going on. 30 Million rakyat suffer just to benefit 20 or 30 crony AP holders, all related to the Ministers. well said bro…. jibee’s election manifesto to reduce car prices in stages turns out to be another desperate attempt to get more votes. Then our current road tax calculation should also revised since not all bigger cc cars are luxury and not all small displacement engine car is a cheapo car. The definition of EEV should be made by Cronies. Prius is a Large Family Car? It can do averagely 4.5ℓ/100km. Way better than 7.0ℓ/100km, so now what? what kind of mode to justify the fuel consumption?? thank for good info. very interested in Hydrogen and Fuel Cell technology and hope that manufacturers will develop more faster since fuel price increase years by year. To summarize everything…. Don’t expect any changes apart from the withdrawal of excise duties for CBU hybrids. Comparing high spec variant vs low spec variant and claim as price reduction is total bullocks. I wonder how many ppl will they fool with this. shall we expect an announcement for Puspakom or another crony company to do the “fuel-efficiency” tests? As usual, they always come up with the surface info only…eg the incentive side, so that they can always play around with it later…BN style..
After so long and delay, yet still can’t came out with the incentive for hybrid vehicle or EEV. May be a nice excuse to collect more tax in between the delay. EEV? Why do i see the silhoutte of an X6? Alamak, wait so long for the breaking news and all they say is that certain incentives will be accorded if they fall into EEV category. My humble Golf Tsi also falls into this category, but by how much is the reduction? Thats what we Malaysians want!!!!!!!! At least give the poor and middle income a fighting chance to get a decent car for all the hard work they put in but looks like only the rich will continue to enjoy and gomen will continue to whack on the middle and poor income because they have no say! That’s life in boleh land today in 2014 … What a waste of time and tax payers money spend for this stupid NAP report 2014 … it clearly written to create more confusion, adding more categories and breaking them down further to confuse the rakyat !! See how much money it would have saved. Then that money spend by the cronies to come up with these report alone could have purchased a few minivans for some charity homes. That would have been a better gesture from Gomen rather than all the hype and in the end 31 pages of crap which means nothing to the people and in no way beneficial to help in this tough times. Ini semua macam haramjadah. Lepas ini semua naik kereta kangkung………………..menteri kangkung. Ya lor, shud say Bak Kut Teh as well..
NAP 2014 is boring and not aggressive. The report is like a form three write up and one person work. Why hire so many people to work on such crappy policy…. Still cannot disclose the incentive matter for hybrid or EEV. Sad to hear about this information. Fuel consumption is a given these days. Regardless of the fuel consumption/EEV benefits, potential OEMs planning to set up shop in Malaysia would have a ready line up of models that can easily meet the EEV definition. The question is how to create the win-win scenario for potential investors. MAI should not waste time by providing vague description of the EEV and automotive technology that it would like to see being invested into the country. Rather it should be specific. For example, if Malaysia would like to attract companies such as Tesla or BYD, it should dive straight into providing heavy incentives for the kind of EV powertrains that these OEMs are producing. Otherwise most will just wait and see, as it currently makes more sense to invest in Indonesia, Thailand, Vietnam and soon Myanmar due to bevy of benefits ranging from cheap labour, cheap land, tax breaks and larger domestic markets. 2) saga fl- b segment – 8.6l/ 100km – not eev. if want to create wayang also please make sense la. dont simply pull from the sky. see our proton fren sweating already. u supposed to protect them. not humiliate them. They have taken so many efforts to create a policy that does not change anything beneath it. Just create two corporate public listed to accommodate the cronies. Let them have equal numbers of AP (according to today import car numbers). Then people purchasing power will determine the prices of AP, and their willingness to buy imported cars. In this way, you still take care of cronies but with compromise, the sales tax gain will be transparent and used to fund infrastructure. Step 2, equal playing field for CKD. You can have Proton to write the standards of car equipment (safety, fuel consumption etc bla bla) to be advantageous to them. This makes Proton competitive with compromise. Invite more to come for CKD assembly, this makes us competitive in manufacturing wise, no doubt. You want Malaysia to be technology orientated, not labour right? This is a good way. As for the green and environment, impose carbon + fuel consumption + CC to replace existing C.C structure. This will be gradual (not too much from existing structure, of course you cater for mass). Increase gradually each year, this way you promote environmental technologies in cars, while at the same time, eliminate old cars on the road. Car prices reduction in 30% in 2017 is impossible, inflation alone makes it hard to comply. After reading minister statement, all viewer comment as a consumer rakyat, I still do not know what is the benefit I will get from this. If I walk inside the car sales room today , am I getting a new car price or so call new car price with up to 30% reduction? Can paultan.org do a summary of cars that fall under the various categories? Like Jaguar and Audi would have done a lot of work to get the weight of their luxury cars down to less than 1800 kg to lower the fuel consumption but they may not qualify as they are too light??? Not logical, so would love a summary of the exact vehicles that make it and also would love to see what accessories Sisma and DRB throw in to make their luxury cars heavy enough to compete. 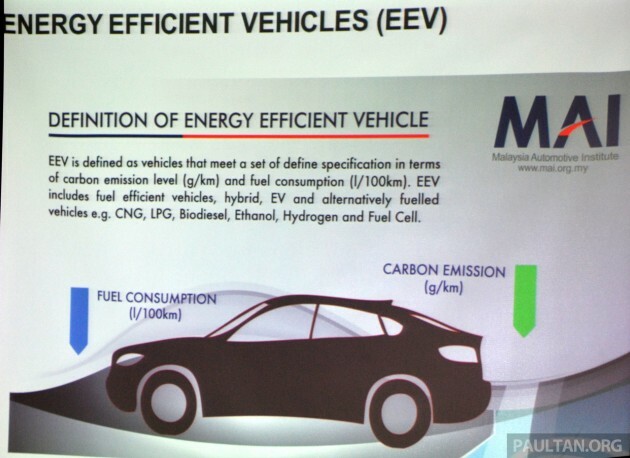 I believe one of the ways to boost EEV production in Malaysia is to introduce Euro4 fuel immediately. Many foreign car brands are already equipped with this technology and there should be no problem to shift their production plant here given the right tax incentives and economic environment. So, the Govt cannot be dragging its feet and give excuses like needing more time to conduct more studies. This car industry issue is not something new and unless you were sleeping for the last 10 years, all these NAP policies should have been implemented by now.